Previously, We had many useful posts for Android mobile users, now we brought you a new useful app for daily purpose, which is a handy app for everyone to convert values from one unit to other units. Here is the app called ConvertNow. 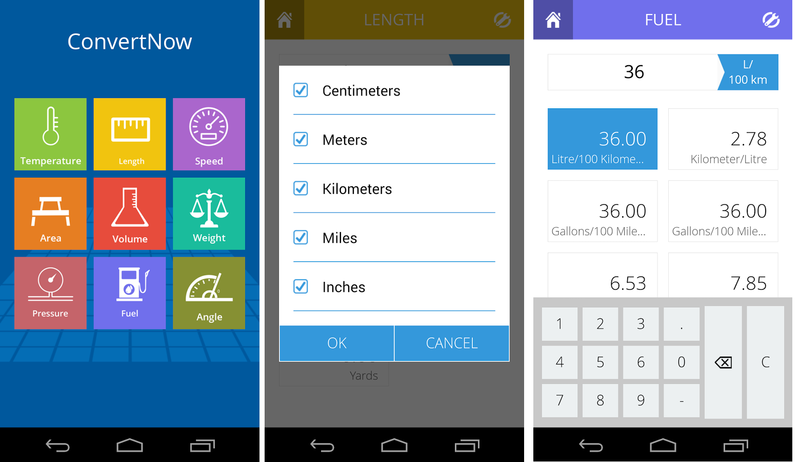 ConvertNow is a simple unit converter app which occupies very less space on your mobile. Though, I found many other apps on Google play which are similar apps for unit conversions. But, I found each app has their flaws like low speed, complex design, occupying lot of space etc. Here in this app, the part which I like most is it has a clean and clear user interface. It can be useful for commonly used conversions in day to day life. Easy to download and occupies less storage space i.e. It occupies only 1.2 MB which is less than an mp3 song. It is an offline app so; there is no need to have Internet once after you have downloaded this app. It is a free app with no ads within the app. You can download the app in the Google Play store for free. It is useful to students, employee, workers and etc. I have observed that there have been many updates since the launch of this app. Developers are updating the app with new features from time to time. Moreover, this app has very nice review and rating. Here is the link to download this app. Have a try and give your comments below in the comments box. Videocon offers one of the best prepaid postpaid service in punjab. Device Converter program is an easy, adaptive and also yet an astonishing allin 1 Unit Converter Calculator program that's developed bearing in your mind regular utilization of apparatus converter at various activities every afternoon. It's just a universal component converter program that's effective at reversing components of distinct types. Basic to utilize beautiful user-friendly and graphics user interface. Thank you so much share great article. Technology and gadgets news liked me. my users would benefit from some of the information you provide here. Please let me know if this ok with you. Thank you. Really wonderful post! This is really helpful. Thanks for sharing. Interesting blog, it gives lots of information to me. Thanks for sharing. Impressed in your way of writing. indeed, I’m just always astounded concerning the remarkable things served by you. Some four facts on this page are undeniably the most effective I’ve had.